Well it has been long enough. Here are some better pictures! Now that we have had Banner for a few weeks, I can better tell you what he is like. I do retract my former statement about how he only peed once indoors. After I wrote that, he peed everywhere! Since he's not neutered yet (but will be tomorrow!) he has the urge to mark his territory... everywhere. Banner (or as I call him, Banner Bananer Naner) is a pretty great dog. 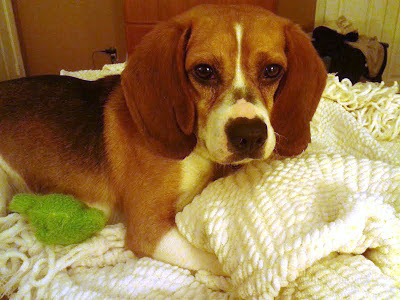 He is a five year old beagle but is small and extremely energetic for his age; everyone thinks he is a puppy! He loves to roll around on his back; this is one of the first things he does when he wakes up every morning. He does sleep with Todd and I in our bed. Sometimes he will even sleep with Jose, the cat. They get along pretty well. As for Lily the cat... well, let's just say she is watchful. I was surprised at how well behaved Banner was when I gave him his first bath. He just sat in the tub very still until I was finished. Then he went to the basement and was rolling around on his back all over the carpet, trying to dry off. Let's just say it was pretty hilarious! Next time, we will definitely be taking a video! Banner is a snorter. He barks only when we leave him to go out or if he is playing with his bone. Very occasionally will he get in a weird mood and bark at the cats. But yes, he is a snorter. We call him our pig. And he loves to play in blankets. So he is our pig-in-a-blanket. He still loves to lick fleece-like blankets. And along those lines, he loves soft toys. Banner does not know any commands besides "NO", which is a good thing. Todd is trying to teach him the word "SIT". Hopefully he will pick up some commands soon. I am sure he will as he is pretty smart. And as a former non-dog person, I have to say that I have taken to Banner. Dogs are not as gross as you think when they are yours. Now don't get me wrong... I am still not into other people's dogs; I still consider myself a cat person. These things take time people! And here is a doggie bowl I made him at a ceramics painting place. (It's more like the communal pet bowl right now.) The plan was to cover the entire bowl with those flowers but after, well, about one, I decided just to do a few. Very time consuming and tedious... especially since you have to do three coats on everything!